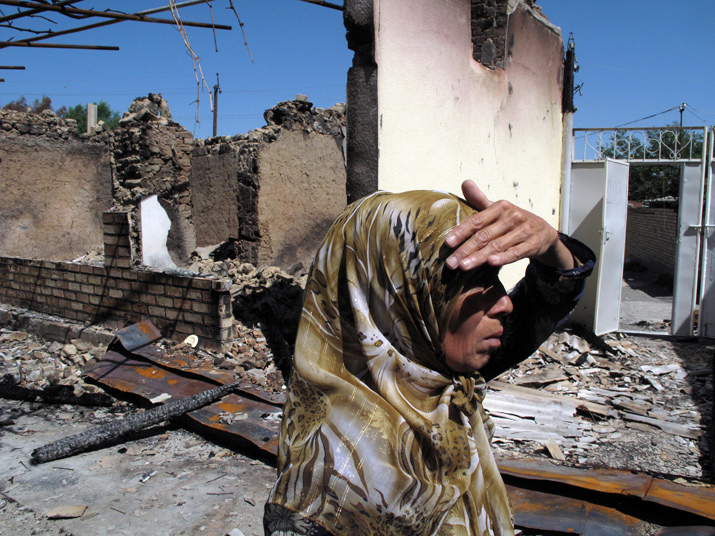 A woman walks through a destroyed neighborhood in Osh. This report contains: an executive summary; background on the crisis; Doctors Without Borders/Medecins Sans Frontieres (MSF)'s response through medical and mental health assistance, as well as provision of basic hygiene items and donations of medicine and equipment to health facilities; the real challenges facing the affected population today; obstacles to receiving health care, including an armed presence in hospitals; and the need for psychological support. On June 10, violent clashes between Kyrgyz and Uzbeks erupted in southern Kyrgyzstan, lasting five days, leading to major population displacement both in and outside the country. Doctors Without Borders/Medecins Sans Frontieres (MSF) began its emergency response on June 15. Five weeks after the clashes began, the violence still continues and access to health care, particularly for the Uzbek community, remains problematic. MSF teams on the ground note that the presence of armed personnel in and around some health facilities is deterring many people from seeking the medical and psychological assistance they urgently need. A climate of deep fear and mistrust exists between the Kyrgyz and Uzbek communities, and the fear of not receiving adequate and impartial health care further impedes people from visiting a health facility. Violence remains a daily reality. Each day, MSF medical teams are providing treatment for patients who have suffered beatings and other forms of violence. Since the start of the current crisis, MSF has provided over 1,400 medical consultations. Although MSF has launched a mental health program, there is still an overwhelming demand for psychological support. MSF is calling upon responsible authorities to immediately ensure the necessary conditions are in place to allow access to health facilities. In a context of sustained tension, it is essential that medical facilities remain neutral ground, so that all people, regardless of their origin, can be provided safe referral and access to health care. In the current circumstances, the presence of armed personnel in the facilities deters people from receiving the care they urgently need.